Growing cannas in your garden is an easy way to create instant tropical flair. Cannas are tropical and subtropical flowering plants with large, banana-like leaves. A surge in interest and hybridizing has resulted in a dazzling array of cannas to choose from, many with large, showy flowers and variegated leaves that look like stained glass when the sun shines through them. Cannas are often grown for their foliage alone. The large, paddle-like leaves come in greens, blue-greens, variegation, and stripes. Much hybridizing has been done to create more attractive flowers. 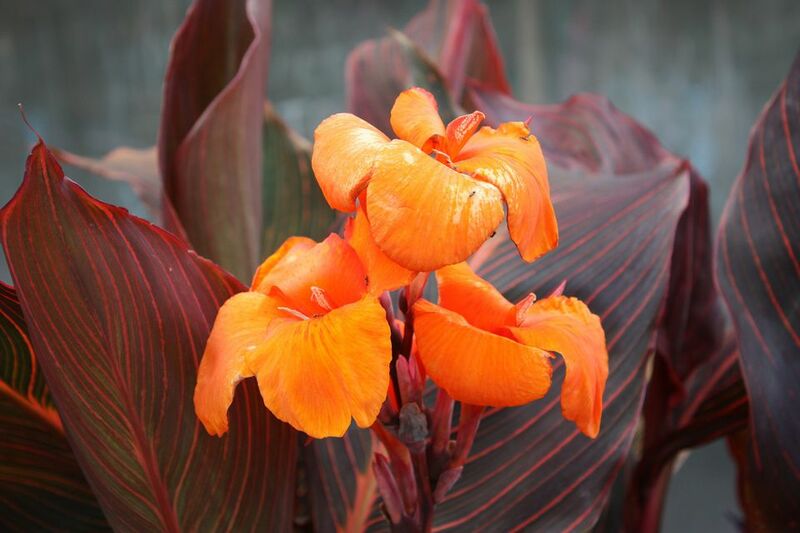 Somewhat tubular and lily-like, Canna flowers come in shades and combinations of yellow, orange, red and pink and are borne on tall stalks poking out of the foliage. Because most Cannas sold today are the result of many crosses, Cannas are rarely classified and are simply considered hybrids. Type and Hardiness Zones: Canna lilies are only hardy perennials in USDA Hardiness Zones 8 - 11, but gardeners in cooler areas have the options of growing them as annuals and letting them die back in the winter or digging and storing the tubers, to replant in the spring. Mature Size: With all the hybridizing going on, you can now find dwarf cannas that reach only a couple of feet tall and towering varieties that approach 10 feet - and everything in between. Generally, they fill out to a spread of about 2 feet wide. Sun Exposure: Cannas do best in full sun. They may need more water, in really hot climates, but they need heat to spur their growth really, and full sun gives it to them. Soil pH: Cannas like a slightly acidic to neutral soil pH. Cannas need lots of water. You can even grow them in sitting water. Blooming depends on the climate and weather. In areas with cool springs, the plants may be slow to get started. Potting them up indoors, before your last frost date, and moving them out while they are already growing, will help them bloom earlier. In USDA Zones 8 and up, cannas will repeat bloom throughout summer; throughout the year in Zones 9 and above. Species cannas will even bloom the first year, from seed. Since most of the newer varieties are hybrids, canna lilies are generally grown from rhizomes, rather than seed. Plant the rhizomes 4-5 inches deep, after all, there is the danger of frost. If you'd like to get a head start on the season, pot them up indoors, 4 - 6 weeks before your last frost and move them out once the temperature warms. Keep the rhizomes moist, but not soaking wet. Once the plants are up and growing, they can handle wet soil. In addition to needing lots of water, cannas are hungry plants. Although they store some food in their rhizomes, feed them in early spring and mid-summer, with a balanced fertilizer. To keep your plants flowering throughout the season, deadhead as the blooms start to fade. If you prefer to grow cannas for their foliage alone, you can cut back the flower stalks before they even have a chance to bloom. Cannas are only outdoor hardy in USDA Zones 8 and above, where they can be left in the ground, growing all year. You can let them die off each fall and start with fresh rhizomes, in the spring. Potted cannas can be brought inside and treated as houseplants. Finally, you could dig and store the rhizomes for the winter. To do that, allow foliage to be killed by a frost. Then dig the plants and allow them to dry in a protected, shady spot. When dry, shake off the excess soil, then wrap in newspaper and store in a dark, cool spot until spring. Check on them periodically to make sure they are not rotting or drying out. Here are more detailed instructions for overwintering tender bulbs. Cannas can't help but be focal points. A single specimen can anchor a circle bed. Planted in a mass, they can look both tropical and Victorian. The colors and tropical feel combine well with other 'hot' colors. Because they like lots of water, you can even grow canna in water gardens. Place potted canna just below water level, and you won't have to worry about hand watering all summer. Lucifer' - red flowers with yellow borders, green leaves, 2' tall. The President' - scarlet blossoms, green leaves, 3 - 3 ½' tall. 'Stuttgart' - orange flowers, green and white variegated foliage, 3 - 4' tall. Tropicanna' - dark variegated leaves with large, orange flowers. Also, comes in Black and Gold. 4 - 6 ft.
Cannas are not often bothered by insects or disease. Their leaves are covered with a waxy substance, so water is repelled, and fungus doesn't usually take hold. Insufficient water will cause the leaves to tear or crack. Pests are minimal, but grasshoppers and caterpillars may munch on the leaves.